Tottenham manager Mauricio Pochettino says his team are starting to feel at home at Wembley after a Harry Kane double gave them an emphatic 4-1 victory over Liverpool. Spurs capitalised on a poor defensive display from the Reds in front of a Premier League record crowd of 80,827 to claim their sixth win of the season and move level on points with second-placed Manchester United. It represents a second successive win for Tottenham at what is their temporary home for this season while a new 61,000-seater stadium is built on the site of their old ground at White Hart Lane. They had previously failed to win at the national stadium in their first three league fixtures of the season, having also struggled there last season during their Champions League campaign. "The team is starting to build confidence at Wembley," said Pochettino. "It is important to make this feel like home, it is key for us. It seems like we are starting to show that here. "It is the third season that we are trying to catch someone. Manchester City are doing very well, they have an amazing squad and one of the best managers in the world. "We see what happens, we believe, we will try to catch them. We are focused every day." 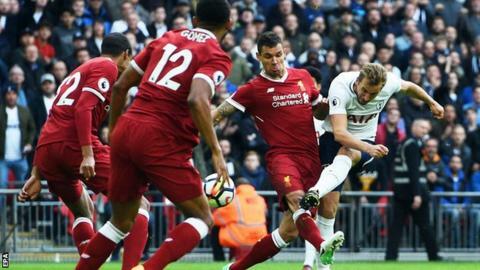 Kane opened the scoring for Spurs on Sunday after four minutes as Kieran Trippier's chipped pass went over Dejan Lovren's head and the England striker took the ball around Simon Mignolet, who had rushed from his goal, to score from 12 yards. Eight minutes later Spurs doubled their lead as Hugo Lloris' long throw was not dealt with by Lovren, who missed a header on the halfway line and Kane was able to square to Son Heung-min to slot home. Liverpool got a goal back as Jordan Henderson's wonderful cross-field pass found Mohamed Salah, who outpaced the Tottenham defence and finished off the inside of the post with a scuffed shot. Liverpool boss Jurgen Klopp responded by taking off Lovren for Alex Oxlade-Chamberlain after 31 minutes, but Dele Alli added a third for Spurs just before half-time as he lashed in a volley from 18 yards. Kane got his second in the 56th minute as he followed up a rebound from Jan Vertonghen's shot after Mignolet failed to clear a free-kick. Liverpool's best chance in the second half fell to Philippe Coutinho but his shot from the edge of the area was pushed on to the crossbar by Lloris with a one-handed save. They dropped to ninth in the table - 12 points behind leaders Manchester City - while Spurs prepare for a meeting with United at Old Trafford on Saturday. Despite Kane's 15 goals for club and country this season, one question mark over the 24-year-old had been his lack of league goals at Spurs' temporary home. Those demons can now be put to bed as Kane finally scored under the Wembley arch, with his 29th shot at the stadium. Ballon d'Or nominee Kane worked tirelessly in attack and caused the Liverpool defence nightmares with his movement, hold-up play and composure in front of goal. It was his fourth double in the league this season and he has now scored 45 goals in 2017 for Spurs and England. One slight worry for Tottenham was when manager Mauricio Pochettino brought the striker off in the 88th minute with what looked like a hamstring problem. This fixture was Klopp's first Premier League game as a manager on 17 October, 2015. Liverpool have conceded 16 goals in the league this season, their worst defensive record after nine top-flight games since 1964-65. They have struggled most on the road, conceding 15 goals, the most in the league this season. Defensive performances like Sunday will make the failed pursuit of Southampton and Netherlands Virgil van Dijk in the summer hurt even more. Lovren will be singled out for his errors, but even after his substitution and Joe Gomez moved to centre-back alongside Joel Matip, Liverpool still looked a shambles. Mignolet is another who will have nightmares about the game, at fault for both of Kane's goals. The Belgium international has made 13 errors leading to goals in the league since making his Liverpool debut in 2013, three more than anyone else. "We had it felt like 60, 70% possession, but after 2-0, you saw the goals, what we did around the goals... easy to defend," Klopp told BBC Sport. "We have defended situations like this all season. "We had our chances, scored one, and the game was on the table. Being down one goal at Tottenham, you can fix it. The third is down to completely not concentrating off the ball. Four mistakes from us. "It is my responsibility. I don't coach the type of defending for the first throw-in. The second goal, we miss the ball and then Son is quicker. We put it on a plate. Reds captain Jordan Henderson added: "I know Dejan Lovren came off but it could have been any of us that came off. "We got back into it but concede a sloppy goal that kills us. A disappointing day and frustrating." Tottenham earned their first win in 10 Premier League games against Liverpool, after a run of three draws and six defeats. Pochettino's side scored more goals in this game (four from 14 shots) than they had in their four previous Premier League games at Wembley (three goals from 90 shots). Tottenham's second goal was the 1,000th that Liverpool have conceded in the Premier League, making them the sixth team to have reached this milestone (Tottenham 1,237, Everton 1,225, Aston Villa 1,186, West Ham 1,163 and Newcastle 1,148). In the past eight games in which he has scored for Tottenham in all competitions, Harry Kane has netted at least twice. Only Robbie Fowler (six) has scored more goals than Mohamed Salah (five) in their first nine Premier League appearances for Liverpool. Son scored his 19th Premier League goal - the joint-most by an Asian player in the competition (level with ex-Manchester United player Park Ji-Sung). This was only the third time Liverpool had conceded four goals in the opening hour of a Premier League game - Stoke in May 2015 and Southampton in February 1994. Spurs entertain West Ham in the Carabao Cup fourth round on Wednesday (20:00 BST) and travel to Manchester United in the league on Saturday (12:30), while Liverpool host Huddersfield at Anfield (15:00). Match ends, Tottenham Hotspur 4, Liverpool 1. Second Half ends, Tottenham Hotspur 4, Liverpool 1. Substitution, Tottenham Hotspur. Fernando Llorente replaces Harry Kane because of an injury. Corner, Liverpool. Conceded by Harry Winks. Substitution, Tottenham Hotspur. Eric Dier replaces Christian Eriksen. Attempt saved. Mohamed Salah (Liverpool) left footed shot from the centre of the box is saved in the centre of the goal. Assisted by Alex Oxlade-Chamberlain. Attempt blocked. Alex Oxlade-Chamberlain (Liverpool) right footed shot from outside the box is blocked. Assisted by Daniel Sturridge. Attempt saved. Philippe Coutinho (Liverpool) right footed shot from outside the box is saved in the top centre of the goal. Assisted by Joseph Gomez. Attempt saved. James Milner (Liverpool) right footed shot from a difficult angle on the right is saved in the centre of the goal. Assisted by Mohamed Salah. Attempt saved. Alberto Moreno (Liverpool) left footed shot from outside the box is saved in the centre of the goal. Assisted by James Milner. Attempt saved. Philippe Coutinho (Liverpool) left footed shot from outside the box is saved in the top left corner. Assisted by Mohamed Salah. Attempt blocked. Harry Kane (Tottenham Hotspur) left footed shot from the centre of the box is blocked. Assisted by Christian Eriksen. Attempt missed. Christian Eriksen (Tottenham Hotspur) left footed shot from outside the box is too high following a corner. Attempt missed. Davinson Sánchez (Tottenham Hotspur) right footed shot from the centre of the box misses to the left following a corner. Offside, Liverpool. Emre Can tries a through ball, but Roberto Firmino is caught offside. Goal! Tottenham Hotspur 4, Liverpool 1. Harry Kane (Tottenham Hotspur) right footed shot from the centre of the box to the bottom right corner following a set piece situation. Attempt blocked. Jan Vertonghen (Tottenham Hotspur) left footed shot from the centre of the box is blocked. Corner, Liverpool. Conceded by Serge Aurier. Attempt missed. Harry Kane (Tottenham Hotspur) header from the centre of the box misses to the right. Assisted by Kieran Trippier with a cross following a corner. Corner, Tottenham Hotspur. Conceded by Emre Can.